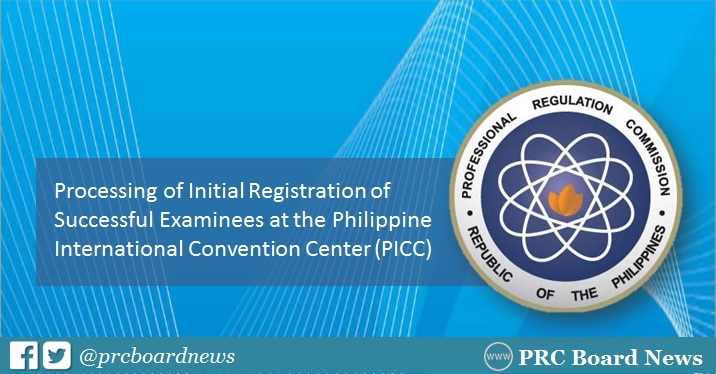 MANILA, Philippines - The Professional Regulation Commission (PRC) Central Office announced on Wednesday, January 10, that the processing of Initial Registration of successful examinees (board exam passers) has been moved at the Philippine International Convention Center (PICC), Pasay City. The advisory will be effective starting Monday, January 15, 2018 onwards. Initial Registrants are advised to proceed to the Ground Floor, PICC Complex, Vicente Sotto Street, Pasay City, Metro Manila. Note that starting January 15, slots for appointment at the PRC Central Office will not be available anymore.